UAE, Egypt and Jordan reportedly planning to have PA chairman be replaced by Mohammed Dahlan. The United Arab Emirates, Egypt and Jordan are planning for a post-Mahmoud Abbas era in the Palestinian Authority, which would leave Abbas’s arch-rival Mohammed Dahlan in control of the PA, the Middle East Eye website exposed on Friday. The longtime rivalry between Dahlan and Abbas has resurfaced as Dahlan is considering running against Abbas in future elections. Abbas has accused Dahlan of collaborating with Israel to assassinate a senior Hamas terrorist in 2002. 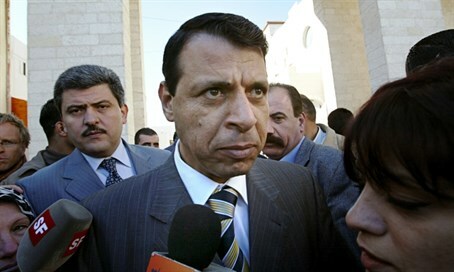 Dahlan has hit back, branding Abbas a “catastrophe” in an interview with an Egyptian television network. According to Middle East Eye, the UAE has already held talks with Israel about the strategy to install Dahlan and the three parties will inform Saudi Arabia once they reach an agreement on its final shape. The key objectives of the plan, according to the report, are to unite and bolster Fatah for the forthcoming elections with Hamas; weaken Hamas by dividing it into competing factions; conclude a peace agreement with Israel with the backing of Arab states; seize control of sovereign Palestinian institutions, the Palestinian National Authority (PNA), the PLO chairmanship and leadership of Fatah; and choreograph the return of Dahlan as the power behind the throne of Fatah and the Palestinian Authority (PA). The alleged cooperation between the UAE and Israel on this issue is in line with previous reports that Israel was carrying out secret talks with Dahlan and that then-Foreign Minister Avigdor Liberman met in Paris with Dahlan – a report Liberman denied. One of the prime movers of the plan to have Dahlan replace Abbas is Mohammed bin Zayed, the crown prince of Abu Dhabi who made clear to Jordan that differences over Abbas affected bilateral relations, according to Middle East Eye. At one point, the Emiratis demanded Abbas’s arrest, a ban from him entering Jordan or using Jordan to travel abroad, the report stated. The plan was corroborated by a senior Jordanian source who briefed MEE after the visit by Dahlan to Amman on March 31 this year, his first to the kingdom in five years. The cover for Dahlan's recent visit was to attend a wedding ceremony, but its objective was to request Jordanian intervention to reconcile him with Abbas, according to the source, who said Jordan is wary of Dahlan. His points of strength are his strong ties with the UAE, Israel and the U.S., the source told MEE, but he is also considered to be unpopular among Palestinians and is accused of corruption and links to the Israeli security services. The policy was to continue to enhance contacts with Dahlan and to show interest in embracing Fatah’s reconciliation, but to tell him to wait until after the American presidential elections and to ask for U.S. help in pushing Abbas towards a reconciliation. Jordan would tell Dahlan that the ground needed to be prepared before such a move, but at the same time “test Dahlan’s sincerity and truthfulness” by asking him to support Jordan’s role in Jerusalem in practical ways, the source told MEE.